If you are building a Twitter client application that is accessing the home timeline, account settings or direct messages API endpoints (typically used by traditional client applications) or are using our User Streams product, you will need our permission if your application will require more than 100,000 individual user tokens. As you might expect, as with any decision by a big company to lock out 3rd-party developers, people were upset. Twitter’s move, though, cut far more deeply: it wasn’t just that people really loved their 3rd-party apps; rather there was a deep sense of betrayal because 3rd-party app developers were unusually responsible for Twitter’s success up to that point. Twitter launched as an SMS service, but quickly the web app became the company’s primary focus. No surprise: at that time, the conventional wisdom was that websites would be the dominant interaction layer for a good long time. Of course that idea seems positively quaint: we now know that on phones, the platform with by far the largest share of both computers and attention, apps are far more important than the web, and the companies that recognized that shift early have benefited tremendously. Twitter is on that list, but not by their own doing. Just months after the first iPhone’s release Craig Hockenberry built Twitterrific, the first mobile Twitter client, and the use case was so compelling that all sorts of people who would normally not consider jailbreaking did it anyway just for his app. In fact, I would not be surprised if Hockenberry’s app had a direct impact on Apple’s decision to open up the App Store. The impact on Twitter was just as profound: it turned out that character-limited tweets and a timeline focused on the here-and-now were a brilliant match for a computer that was in your pocket and thus available in found moments and unusual happenings. Over the next few years Twitterrific and a host of competitors honed the Twitter user experience, and these developers — and users — pioneered many of Twitter’s most important features, making the company, by 2011, worth $8 billion and on the road to a 2013 IPO. And Twitter was slamming the door in their face! In fact, I think Twitter’s decision was absolutely justified: in April 2010 Twitter launched promoted tweets on their website, but as just noted, it was already clear that for most users the website was a secondary platform for consuming Twitter. If Twitter were to succeed in advertising it needed to place those promoted tweets and any other advertising inventory it might devise into Twitter apps. The problem, though, was that by definition Twitter had little control over how its content was presented in apps built by 3rd-party developers. And so, three days before the promoted tweets announcement, Twitter bought Tweetie, an app many (including myself) thought was the best 3rd-party Twitter app of all. We will not be shutting down client applications that use those endpoints and are currently over those token limits. If your application already has more than 100,000 individual user tokens, you’ll be able to maintain and add new users to your application until you reach 200% of your current user token count (as of today) — as long as you comply with our Rules of the Road. Once you reach 200% of your current user token count, you’ll be able to maintain your application to serve your users, but you will not be able to add additional users without our permission. The reason this history matters is that Twitter has spent the last month cracking down once again. The first target, famously, was Meerkat, an app that allows you to stream live from your phone to anyone else with the Meerkat app. Within days of its release the app was a huge hit in tech circles, aided by its use of the Twitter graph: you signed in with your Twitter login and were immediately able to follow anyone you already followed on Twitter. Just two weeks after its launch, though, and on the eve of South-by-Southwest, Twitter cut them off. The second target was more surprising, but in retrospect — like the app situation — telegraphed by Twitter. A year ago Twitter acquired Gnip, at the time one of only four companies with access to the full Twitter firehose of every tweet passing through the service. And then, over the weekend, came the other shoe: Twitter is going to cut off Gnip-competitor Datasift and everyone else. The most obvious justification for killing Meerkat was that Twitter was on the verge of launching Periscope, an app that does basically the exact same thing (Periscope has since launched). Why should Twitter be expected to give its direct competitor a leg up? 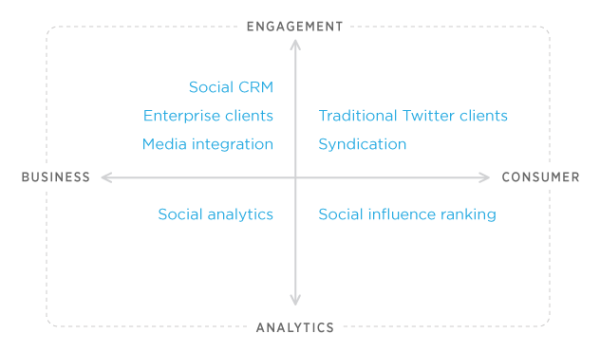 Today on Twitter we see a broad and deep variety of individual developers and companies building applications using data and content from the Twitter API…with our new API guidelines, we’re trying to encourage activity in the upper-left, lower-left and lower right quadrants, and limit certain use cases that occupy the upper-right quadrant. Datasift falls squarely in the lower-left bracket, which means Twitter’s decision is a complete reversal of their previous stated stance, a stance that led to investments worth hundreds of millions of dollars. It’s an ugly move. The problem for Twitter is the aforementioned user growth: it’s even uglier. Last quarter the company was celebrated for adding 13~16 million users, but I was far more troubled by the company’s explanation that it lost 4 million users because of iOS 8. What actually happened was that if you ever signed up for Twitter on iOS 7, Safari kept syncing your tweets whether or not you used the service. iOS 8 fixed that, which means those 4 millions users were only counted as active because of an iOS bug! Given that Twitter’s reported metric is monthly active users, how many of their 288 millions active users are actually humans reading their timeline as opposed to randomly updating apps or visits by an abandoned user to a page with an embedded tweet? The company has responded by doubling down on monetization, and that’s where this decision makes sense. Wall Street actually loved last quarter, because Twitter monetizes so well, and in the absence of user growth the company is clearly focused on growing revenue per user instead, and data is a low-hanging fruit. Whereas Google is valuable because it knows what I want, when I want to get it, Facebook knows who I am, and who I know. Ideally, they also know who and what I like, but it’s a much weaker signal. Twitter, on the other hand, knows exactly what I like and what I’m interested in. It’s obvious both from what I tweet about, but especially based on who I follow. If an advertiser wants to reach someone like me – and they certainly do, given my spending habits – Twitter is by far the best way to find me. Were Twitter able to consistently capture this signal and deliver effective ad units that caught their user’s attention, they could command some of the highest average revenues per user on the Internet. Indeed, I would argue that what makes Twitter the company valuable is not Twitter the app or 140 characters or @names or anything else having to do with the product: rather, it’s the interest graph that is nearly priceless. More specifically, it is Twitter identities and the understanding that can be gleaned from how those identities are used and how they interact that matters. If one starts with that sort of understanding — that Twitter the company is about the graph, not the app — one would make very different decisions. For one, the clear priority would not be increasing ad inventory on the Twitter timeline (which in this understanding is but one manifestation of an interest graph) but rather ensuring as many people as possible have and use a Twitter identity. And what would be the best way to do that? Through 3rd-parties, of course! And by no means should those 3rd-parties be limited to recreating the Twitter timeline: they should build all kinds of apps that have a need to connect people with common interests: publishers would be an obvious candidate, and maybe even an app that streams live video. Heck, why not a social network that requires a minimum of 140 characters, or a killer messaging app? Try it all, anything to get more people using the Twitter identity and the interest graph. I think it’s very likely MoPub is Twitter’s AdSense: Twitter has a great signal about its users — whom I follow is a great approximation for what I’m interested in. That’s even more valuable than whom I know. However, Twitter is not a great platform for any sort of display advertising; the targeting would have to be much more precise than what is possible with current technology for users to tolerate anything more than promoted tweets. MoPub solves this riddle; Twitter can serve up highly targeted ads everywhere but Twitter proper. It’s a great acquisition. Twitter’s story in many respects makes me think of Google: both companies started out benefiting greatly from openness and the power of both connecting users to what they were interested in and opening up powerful APIs to developers. The monetization model is even similar: note the AdSense reference above. Over time, though, Google has pulled more and more of its utility onto its own pages (and the revenue balance in the company has followed), just as Twitter focused on its own apps, and now Google is even starting to eat its best customers like travel websites and insurance agents (members-only), just like Twitter ate Datasift.